← Why Desire a Better Government? Small wonder the ‘Judicial’ system of Italy is so eager to engage in the press. They spam, lie, fabricate, commit serial calumny and sue anybody that replies with truth and fact. There isn’t one piece of evidence that is more than dubious. 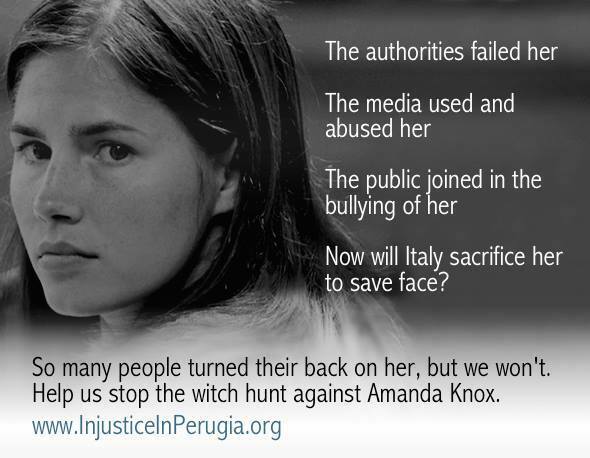 Nobody’s best interest is served by letting Amanda and Raffaele be framed for crimes they didn’t commit. You and I would just go to jail for the rest of our lives without a line in the newspapers. Defend Amanda and you defend yourself. It’s now or never…. This entry was posted in Dystopian Government. Bookmark the permalink.